This weekend I decided I wanted to learn about the new stuff in Java 1.5. Generics, auto-boxing/unboxing, etc. This is the kind of reading that works best for me in a printed book. 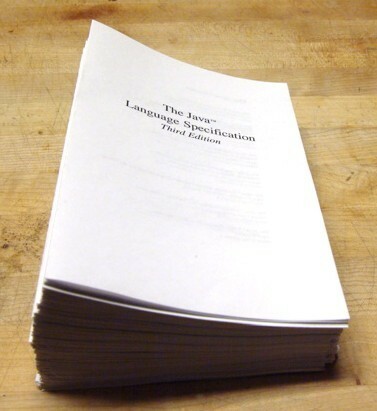 Fortunately for me (and for Cheap Impostor), Sun's official Java Language Specification is available as a free PDF file, with license given to each user to print one copy. Click here for a copy of your own. First, I fired up Cheap Impostor, and adjusted the zoom and offset settings. I tried to get the outermost content as close to the printable edge of the paper as possible, and also to leave about 3/4-inch margin on each half of the page. Here is a screenshot of Cheap Impostor showing the settings I came up with, and the preview of my output when I was pretty happy with the settings. For long books like this one, and for the binding style I wanted to use, "Sheets of paper per signature" should be 1. If I wanted to sew the pages before binding, I would have chosen something like 4, but that would have turned this from a 2-hour project into a 2-day project. 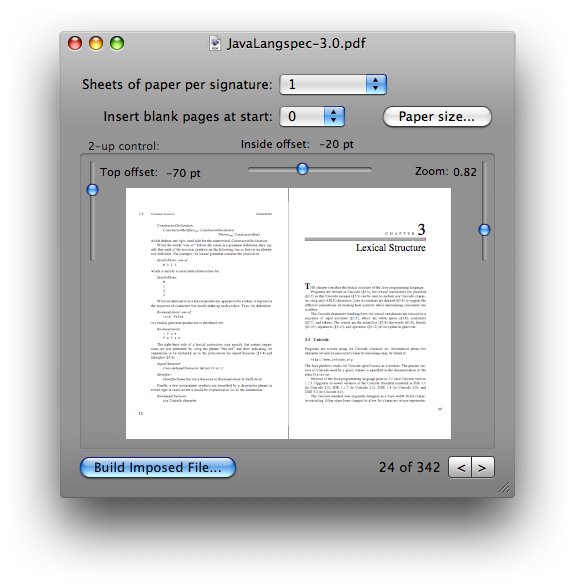 It turns out I've never actually used the "Insert blank pages at start" feature. Maybe I should take it out. I often need to use negative offsets when imposing documents intended for full-sized letter paper. In this case, the top offset was -18pt, and the inside offset was -50pt. The zoom factor of 0.81 is what I spent most of my time adjusting in order to get the outside margin "just right" (about 0.25 inches). It turns out that for this book these settings are not perfect. The page numbers on chapter headings get a bit chopped off, but all-in-all, it's pretty good. 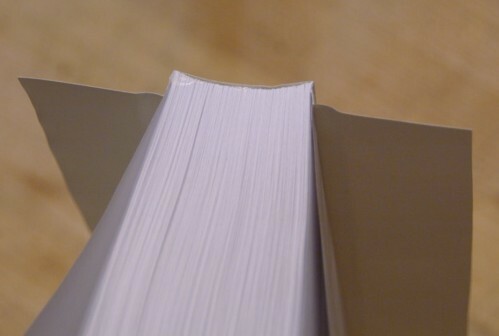 The main issue when printing is figuring out the binding edge. If you do not have a duplex unit, it doesn't matter what "Binding edge" setting you choose in Cheap Impostor's "Preferences" panel, but which you choose determines how you flip the stack of paper over when printing the back-sides. Until writing this program, I didn't think much about the different ways of flipping a sheet of paper over. 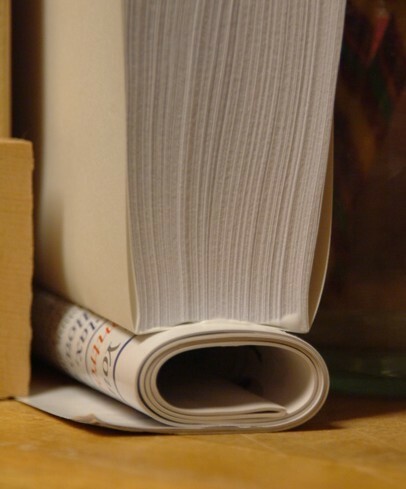 As an example, when you turn a page of a book, you're flipping along the long edge. When you're using a clipboard, and you turn to the next sheet, you're flipping along the short edge. 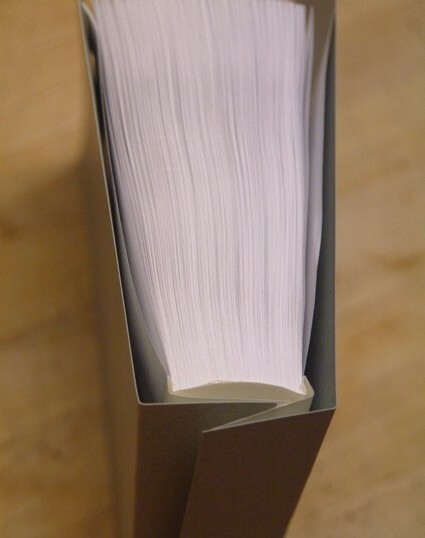 If the content of those pages matches the binding edge, the flipped side is right-side-up. If it's a mismatch, the flipped side is upside-down. If you do have a duplex unit, your printer dialog has a "binding edge" preference. All you need to do is match that setting to the "binding edge" preference in Cheap Impostor. It didn't come up in this document, but the most common problem people have when using Cheap Impostor is that it doesn't respect cropping or page insertion operations or other esoteric PDF alterations. The solution is to open the file in "Preview" (not Acrobat Reader) and Print, then "Save as PDF..." - the file produced by this method is cleaned up and ready for Cheap Impostor. This is the most time-consuming step (for most books), but it's also the one that there is the least to say about. 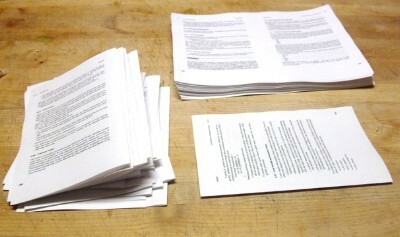 Your goal in this step is to turn the pile of pages that came out of the printer into the pile of folded pages you see on the right. 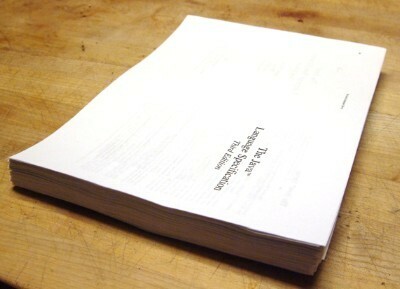 a 648 page PDF becomes 162 pieces of paper...oh the paper we've saved (and used)! Now for the fun part! For my first few books, I used piles of books as my book vise. At some point I decided it would be worth the investment of an hour to build my own vise. As you can see from the figures below, it's a simple thing: I made it from 2 2x4's, some some scrap wood and some long bolts with wingnuts. Details are in the Cheap Impostor documentation, but it should be pretty self explanatory. 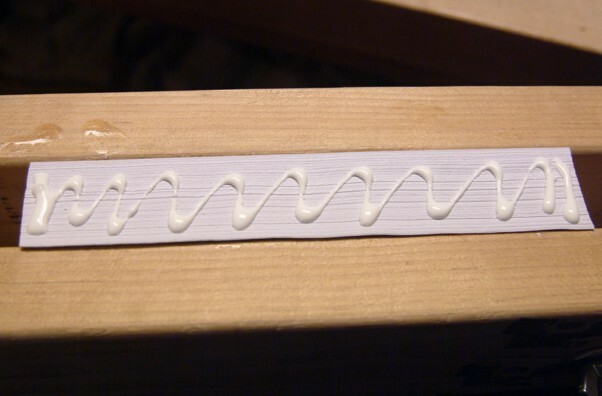 Then slide the signatures close to the edge of the vise, and squiggle glue along the folds. ...and smooth the glue along the folds. Here, be careful to make sure each fold gets covered with glue. I stopped at this step on my first book. I still have that book (it's the PDF version of my camera's manual). It still "works", but it's getting uglier every day. Since then, I've been working on different ways of covering my books. Here's the way I like the best so far. I borrowed the idea from the way O'Reilly books are covered. Here's what I do. (again, for details missing here, check out the Cheap Impostor user's manual. The key to this cover style is an extra piece of paper between the cover and the "block of pages" you just made. After the glue on the binding has dried, glue another piece of paper against the binding. 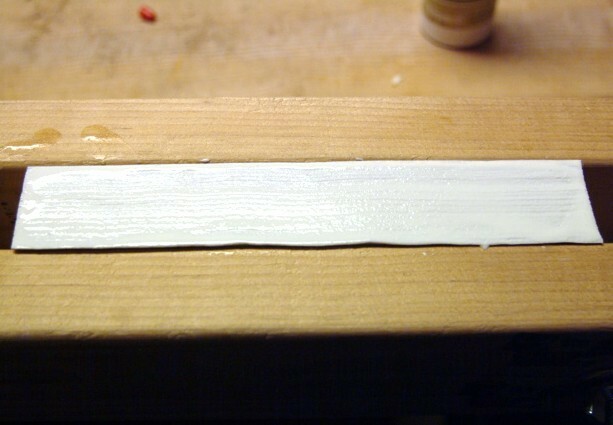 After that glue has dried, glue the paper around the corner of the binding by 1/4". 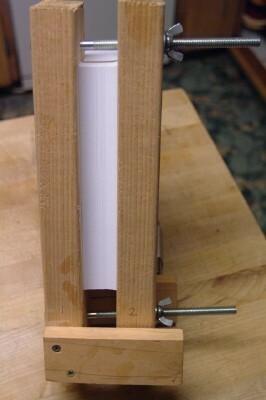 Here is the extra sheet of paper being glued to the binding. I like to let it dry while resting on some rolled-up junk mail - this helps the paper stay stuck to the binding. Next glue the paper around the edges of the binding by 1/4". 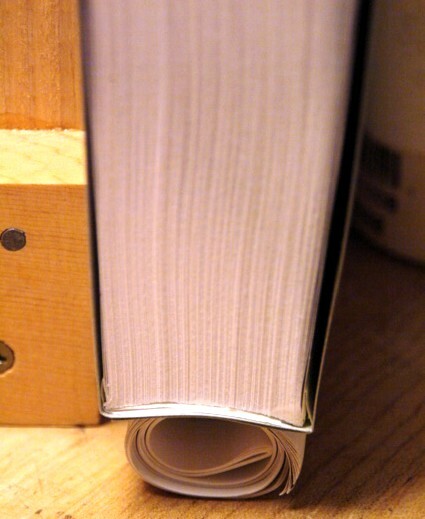 Also, trim the paper so that it doesn't quite wrap around to the other edge of the binding. 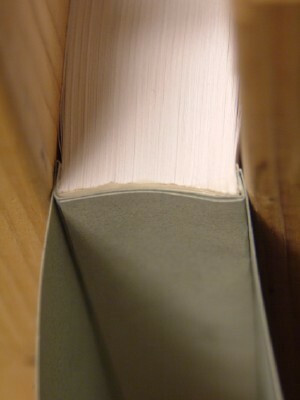 This is how the cover interleaves with the binding paper. The first gluing step is to glue the inner cover layer to the inner paper layer (not to the binding edge). Then glue the second paper to this cover, and the second cover (which should be the front cover to the second paper. Square everything up and use the rolled up junk mail trick to help press it together while drying. Finally, fold the cover back at 1/4" from the binding and carefully glue the cover to the 1/4"-wide exposed part of the folded-back paper. After it dries, you're done! 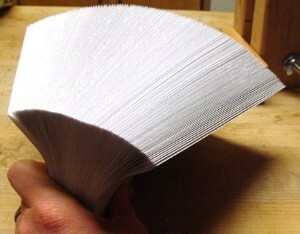 This photo shows how I folded the cover sheets to the correct length. I used to trim them, but folding makes a thicker cover, and makes it look similar to Japanese book covers. That's a bonus! 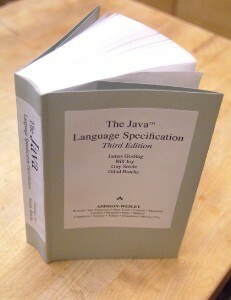 Less than a day after having the idea to bind this book, I had it in my hands, all ready to learn the goodness of Java 1.5. 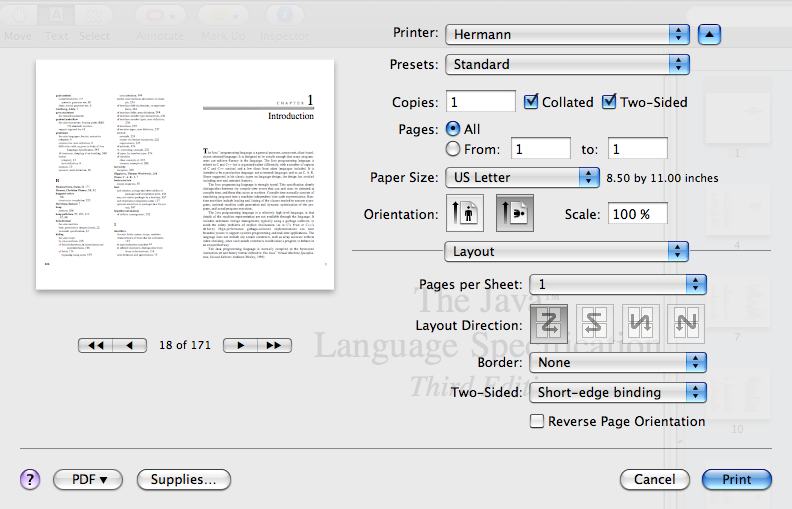 As a final touch, I used "TextEdit" to create the front cover and binding-edge text. Not too shabby! I hope this helped or inspired you to make your own books.